So much for all those denials about that “Ministers for Keryl” email. You’d think that President Obama’s recent embrace of marriage equality might have made her reconsider this course of action. I mean, it’s likely that the national platform will contain a plank endorsing marriage equality. Even putting that aside, non-discrimination in all forms is a basic and bedrock Democratic value. 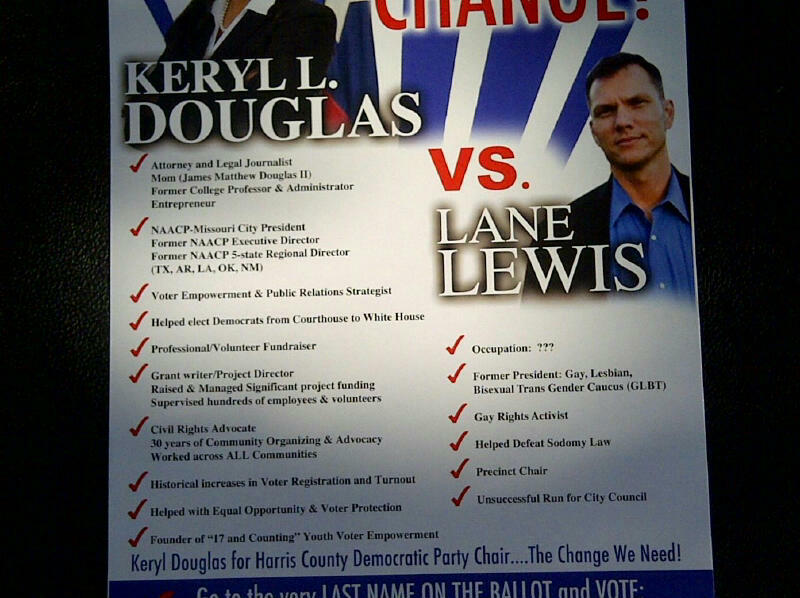 How in the world does Keryl Douglas think she can lead the Harris County Democratic Party if she doesn’t share those values? Primary campaigns are always the worst, because we’re all supposed to be on the same team. The fights we do have tend to be that much nastier because we otherwise generally agree with each other, on the goals if not always on how we reach them. If you’re going to launch a personal attack against a fellow Democrat, it really ought to be for conduct unbecoming of a person who would represent us in that particular office. Producing and distributing this push card is definitely conduct unbecoming, especially for a would-be party chair. For shame, Keryl Douglas. Hateful, but a strong message about her character. It appears that Keryl Douglas has gone out of her way to make some longterm enemies. Her actions in this campaign were unnecessary, unhelpful, unforgiveable and unforgettable. In case she didn’t know already, she will never live this down and her actions will come back if she is ever a candidate for elective or appointive office in the future. That’s not a threat from me, it’s just a statement of the way things are. Her candidacy and her campaign are not helpful to the Harris County Democratic Party, so let us hope she doesn’t win. If she does win, it will be very difficult for her to run the party in this county. The only beneficiaries of her possible election would be the Repugnants. This is gay-baiting plain and simple. “Occupation: ?? ?”–really, Keryl, he’s the interim HCDP chair–the position you’re running for. Low-information homophobic Dem voters may be swayed, but you should have just touted your own background and left Lane off of your card. I predict that Keryl will soon be adding “unsuccessful run for HCDP Chair” to her list of credentials. What makes an ultra-conservative Republican sycophant like you think that any Democrat cares what your opinion is regarding who would make a good Democratic Chair? You are not our friend and you definitely do not have any Democrat’s best interest in mind. It is never right to vote or discriminate against anyone because they are a minority. Never! That you feel it necessary to repeat that crap is despicable. What makes you think that is ever a right or right to discriminate? I know that your Republican buddies have no problem with it, but most Democrats do. That you apparently don’t really seem to think—not thinking is a big part of your problems–that prejudice is wrong. I hope that after this election, you and the Kubosh’s will introduce her and welcome her to your Tea Party, because win, lose or draw she will no longer be welcome by most Democrats. She will be anathema and will permanently lose the support and vote of the GLBT population and the majority of the Democratic voters that support them. She and Elaine Palmer, and only because they are bigots and believe in Republican ideals. I would suspect that President Obama, the true leader of our party would not look upon their actions, accusations and bigotry with any favor. But you should welcome her with open arms and ya’ll can have yourselves one heck of a hate-fest. Right now, your malicious and malevolent cohorts are probably rubbing their portly hands with glee, primed to jump on the other Kubosh candidate, Elaine Palmer, so they can get another unqualified Tea Party oaf, Ken Shortreed onto the District 215 bench. All of you miscreants can deny it all you want, but that won’t make it untrue. Felix has already given Shortreed his stain of an endorsement and I just can’t see Downtown Pachyderm president Randy turning away from the club’s chaplain, Shortreed. Yours is an unwelcome and thoroughly unnecessary tale of sound and fury, signifying nothing. Go away and don’t come back.